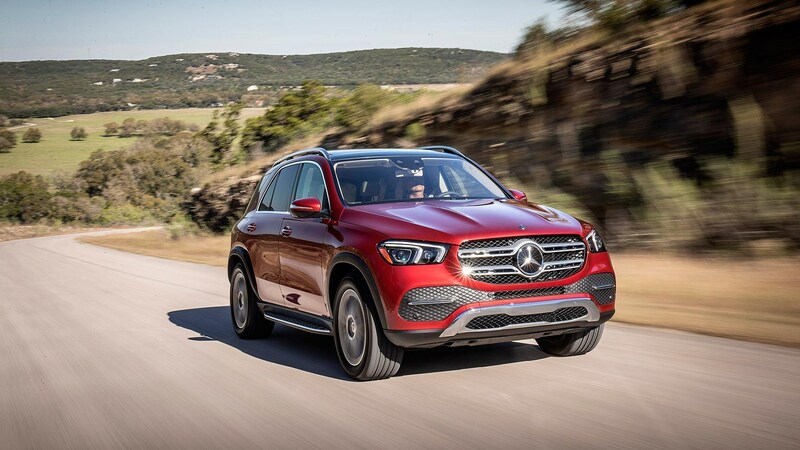 The name may have only been around since 2015, but the Mercedes-Benz GLE can in fact be traced back to the very beginning of the whole premium SUV phenomenon. First launched as the M-Class back in 1997, it predated both the BMW X5 and Audi Q7 as part of the first wave of luxury ‘soft-roaders’ that are now commonplace on UK roads. Fast forward 21 years, and, although technology has moved on, the general concept hasn’t. Build a comfortable, spacious SUV that can scramble up a muddy driveway in Cobham – but more importantly sit eloquently outside an artisan coffee shop in Kensington – and watch it fly. The previous generation certainly did – becoming the bestselling SUV in the history of the company. Expectations for this new model, then, are rightfully high. After all, aforementioned rivals from BMW and Audi have not only caught up with Mercedes, but also stolen a march on their arch rivals in recent years. Time then, surely, for the three-pointed star to take back control. New Mercedes-Benz GLE: what’s new? No prizes for guessing this one, but the GLE’s interior has undergone a Mercedes-Benz A-Class style transformation. Gone is the dated, button-heavy design of old, in its place a tech-heavy environment dominated by the two – standard-fit – 12.3-inch digital displays. More on that later. Other new features include a revised engine range (including a diesel plug-in hybrid version and box-fresh straight six diesels), a suite of driver assistance technology, more space all-round and, for the first time ever in a GLE, the option of seven seats. And while the exterior has undergone what is a fairly mild revamp, it does at least look better than the early press shots we were sent back in September 2018. Decked out in bland metallic beige paint and black plastic exterior trim, the car in said photos did a sterling job of hiding what is actually a sharp, well-proportioned design to these eyes. If you’re into your tech then there really are few better cars in this sector to spend time in. 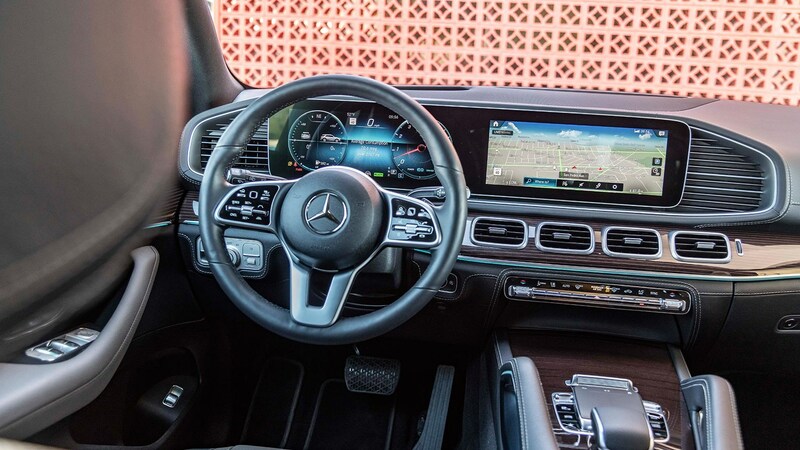 Mercedes-Benz’s MBUX infotainment system boasts crisp, attractive graphics that look bang up to date as you scroll through the car’s myriad menus using either a large touchpad controller or the touchscreen. 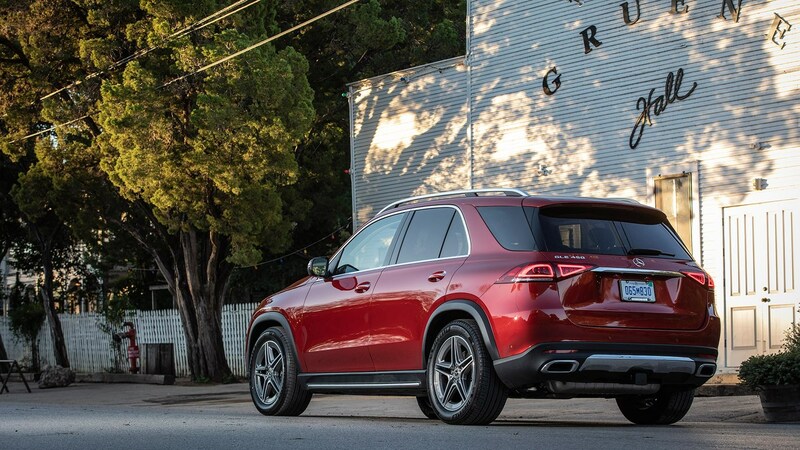 The software itself is a big improvement on the previous GLE, yet the control method isn’t. Manufacturers seem to be jettisoning the rotary dial selector button in favour of other, more fiddly solutions and Mercedes is no different. That said, much of the commands can be done by voice recognition using the Hey Mercedes Virtual Assistant, although, like all systems of this ilk it’s far from fool proof. What’s more impressive, is the optional Interior Assist technology. We were shown a demonstration where the driver could program the sat-nav with just a simple gesture, whereas the passenger – using the same gesture – can switch their massaging seat on. A neat feature that has use beyond simply being a flashy gimmick. Look beyond the technology, though, and the GLE’s cabin still scores exceptionally well. It has a solidity to it that recent Mercedes cabins have lacked, while the overall design is logical and relatively easy to master. Infotainment controls aside, it’s night and day when compared with its predecessor. From launch the GLE will be available with two engines in the UK, both paired with a nine-speed automatic gearbox and 4Matic all-wheel drive. These consist of the 300 d 2.0-litre diesel and 450 straight-six petrol. However, this is but a mere taster of what’s to come with other engines, including a 350 d, 400 d, 300 de (plug-in hybrid diesel), AMG 53 and AMG 63 all set to follow within the next couple of years. Back to the present, however, and while both engines are accomplished, you get the feeling that Mercedes is making you wait for the good stuff. The 362bhp 450 is creamy smooth and provides plenty of go yet is better suited to markets where the price of fuel is inconsequential. There is a mild-hybrid EQ Boost system, but it’s designed more for performance than efficiency, giving an extra 22bhp in short bursts. Meanwhile, the 300 d is punchy enough with 242bhp and 369lb ft of torque (0-62mph in 7.2 seconds), yet is gruff at low revs and may well struggle with the car fully loaded. The sweet spot, therefore, appears to fall on either of the two 3.0-litre straight six diesels when they arrive. We managed to nab a go in the 400 d and can confirm its all the GLE you’ll likely ever need. Fast, relatively frugal and free of the 2.0-litre diesel’s low speed rattles. It’s a fine engine. And, to sweeten the deal, it (and the 350 d) both come as standard with seven seats (a £2000 option on the 300 d) and Airmatic air suspension (not available on the 300 d). We haven’t had a chance to drive the GLE on standard springs, although we can’t imagine they’d be a patch on what the Airmatic setup offers. Providing a composed, unfussy ride that does an extraordinary job of taking the edge off bumps (even with 22-inch wheels fitted), this – along with low levels of wind noise – make the GLE an incredibly relaxing place to spend time in. If you can bring yourself to switch the drive selector out of Comfort and into Sport (really, why would you?) the GLE does a decent job of shuffling through tight corners at speed thanks to a keen front end, but it still feels like a heroic misuse of a vehicle that’s far comfier in waft mode. And talking of taking it out of its comfort zone, the GLE is also available with an Off-Road Pack (although, not on the 300 d version), that, among other features, adds a low-range transmission and extra underbody protection. E-Active Body Control, meanwhile, allows the car to mimic Los Angeles Lowriders by allowing the air suspension on each corner to adjust independently. This adds features such as the Curve drive mode (where the body leans into corners keeping it flat) and an off-road aiding Rocking mode that bounces the car up and down in order to aid escape when bogged down. It’s impressive to watch (and play with at a set of traffic lights) but it’s unlikely to come to the UK with a price tag of nearly £7000 over the standard car. All GLE’s benefit from Blind Spot Assist, autonomous emergency braking, traffic sign assist and the Parking Package (featuring 360-degree cameras and automatic parking). However, it’s a shame that most of the car’s potentially life-saving driver-aiding technology is only available as an option on the one-size-fits-all AMG Line spec. Distronic adaptive cruise control, Active Blind Spot Assist (where the car can automatically brake if it detects an imminent collision with a vehicle in the driver’s blind spot), Active Lane-change Assist (where the car automatically changes lanes when the indicator is activated) and Route-based speed adjustment (automatically adjusts the car’s speed for upcoming junctions or roundabouts) are all part of the same option pack. Can I fit my family in? Opt for a seven-seat GLE and the level of flexibility on offer should prove invaluable for large families. The rearmost seats are – predictably – tight, but there’s enough room back there for kids – or adults on short journeys. Meanwhile, the rest of the cabin is as spacious as you could hope for, with plenty of storage for various valuable items to get lost in. The second and third row seats fold down electrically to give a humungous boot (up to 2055 litres), yet the ergonomics of such a process could be improved owing to fiddly controls and sluggish electric motors. Mercedes-Benz’s dated SUV range had fallen behind its rivals in recent years – not so with this second-generation GLE. The move to seven-seats may have been a no-brainer, but the rest of the car shows off a carefully thought out SUV that majors on technology and comfort, not to mention an (eventually) diverse engine range. You can order one now, but we’d wait a few months until the 350 d, 400 d and plug-in hybrid versions arrive. The former two will only cost a few thousand more to buy than the base 300 d starting at £55,685, yet will come as standard with seven-seats and air suspension, not to mention a better all-round engine.